Kensington Wade (KW) is located at the intersection of Kensington High Street and Warwick Road/Holland Road, directly opposite the Hilton Hotel on Kensington High Street and is well served by public transport. Please use the postcode for Radnor Terrace, W14 8AZ to find us. By Foot We encourage families to walk to school. Scooters and bicycles are lockable within the KW courtyard. 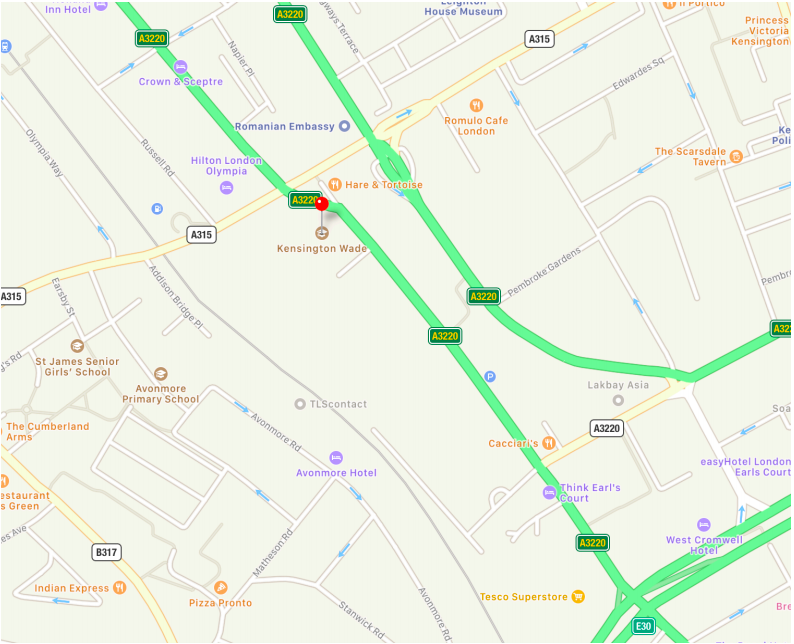 Travelling north along Warwick Road towards Kensington High Street, after passing Tesco on your left (at West Brompton Road/Warwick Road intersection), you will see Radnor Terrace on your left (before Kensington High Street). Turn left here and KW entrance is to your right. From Kensington Olympia Overground Station (5 min walk) Take the east exit on to Russell Road. Turn right down Russell Road, cross to the other side of Kensington High Street and turn left past No. 375 (Residence). Straight ahead of you is a stone sculpture. Turn right down the steps to your right and KW entrance is 100m on your left. From Kensington High Street Underground Station (12 min walk) Turn left out of the station and walk all the way along Kensington High Street until you cross over Warwick Road. Turn left at the stone sculpture and you will see steps on your left down to KW entrance, 100m on your left. From Earls Court Underground Station (10 min walk) Take the Warwick Road exit towards Kensington High Street. Cross over West Cromwell Road. KW is on your left before the Kensington High Street/Warwick Road intersection. If you pass 375 Kensington High Street (to your left) or the Hilton Hotel (to your right), you have missed the turning for Radnor Terrace. By Bus The following bus routes are a two-minute walk from KW on Kensington High Street: 9 (Aldwych/Somerset House to Hammersmith), 10 (Hammersmith to King’s Cross Station), 27 (Chiswick Road to Chalk Farm), 28 (Banister Road/Kilburn to Wandsworth Town Station), 49 (Clapham Junction to Shepherds Bush Station) and C1 (Victoria Station to Shepherds Bush/White City). By Santander Cycles There are bicycles at Kensington Olympia Station, Olympia Way and Warwick Road docking stations. Parking There are Pay and Display bays (also payable with the Ringgo parking App or by telephone) near the junction of Russell Road and Kensington High Street, W14 (for a maximum of 4 hours). Alternative parking is next to Tesco on Warwick Road.